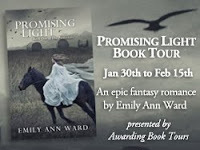 Today we're joined by Emily Ann Ward, author of Promising Light (The Protector Series #1), as a part of her blog tour. Keep reading to check out an interview with her and a chance to win a $25 Amazon or B&N Giftcard! It’s so hard to choose just one! I really like YA series’: Harry Potter, the Hunger Games, Tomorrow When the War Began. I loved The Book Thief by Markus Zusak and the Things They Carried by Tim O’Brien. Favorite writer is probably JK Rowling or Donald Miller. Fantasy, whether YA or adult. The impossible is always fun! I’m Emily, of course :P I live in Oregon right now with my husband and our two cats. I’m in school for Sociology and Linguistics. I love traveling because seeing new places is so fun. I have a big family -- five sisters and two brothers, plus my parents and all my aunts and uncles. I like being outside during the summer, but I lock myself inside like a hermit during the winter because I hate being cold! After years of fan fiction, what finally made you decide to write your own novel? Well, I always wrote a little bit of my original fiction alongside my fan fiction, but it never really went anywhere. I mostly came to a point where I wanted to make my own characters and my own world. Playing with others’ was fun, but I wanted my own, and it was a lot more rewarding. How did the idea for Promising Light come to you? It started off with Grace and Dar and their strained relationship, and I brought in Dar’s mysterious magical family. I wanted Grace to be “chosen” without having to save the world. It’s a struggle on a smaller level, affecting a few countries, not the fate of mankind. How did you pick the character names? My sister’s name is Grace, and I’ve always liked the name. (She’s not too much like Promising Light’s Grace, though she is blonde.) To be honest, the name Dar is very similar to the name of a boy I was crushing on when I wrote this in 2005. Embarrassing, I know! Sierra has always been a name that’s popped up in my stories, not sure why. The others, I’m not really sure. I just pull them out of my head, along with the other crazy stuff in the story. Do any of the characters in your book resemble you or someone you know? At first, Dar was inspired by my crush seven years ago, but he took on his own personality, for sure. As for the others. . .I don’t think so. Sometimes small characteristics resemble people I know, like Matilda is kind of cheeky like my brother David. But in general, they tend to be their own people. I just love the magical and fantastical. Bending reality and supernatural makes a story so much more fun to write. Plus fantasy usually has adventure and conflict, and I like all of that. How long did it take you to write Promising Light? I started a very, very rough draft for Nanowrimo in 2005, but I lost a good chunk of it due to viruses. I rewrote it in 2008, but it didn’t get very far because I didn’t have a direction. Last January, I sat down and made a loose outline. Then I finished a shiny new draft in April. Since then, I’ve just been getting feedback, revising, editing, and proofreading. So, long version: six and a half years. Short version: a year. How long a series are you planning and when is the sequel to Promising Light coming out? This series will definitely have two books, but it could be three. There are also three novellas that act as prequels to Promising Light. So, at least five, possibly six! The sequel should be out late summer or later. I haven’t read either, actually! Since you love Harry Potter, I have to ask - Ron or Harry? Thank You, Emily for the interview! And guys, DON'T FORGET TO COMMENT ON THIS POST WITH YOUR E-MAIL ID FOR A CHANCE TO WIN $25! 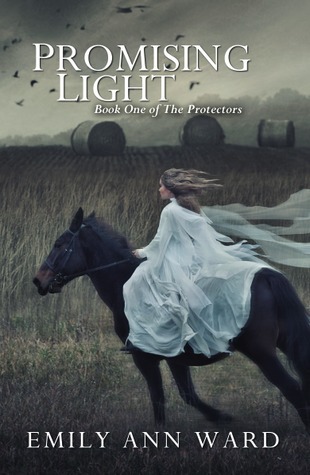 Also, there's currently a paperback giveaway of Promising Light at this link! Don't forget to check it out! Emily Ward was born in Reno, Nevada and spent most of her childhood in Colorado. She grew up with a big family in The Salvation Army. One of her first stories featured a young girl whose doll came to life. The rest is history. She spent years writing mainly fanfiction (thank you, J.K. Rowling), but has since ventured into originality. When it comes to fiction, she writes mainly young adult, literary, and fantasy. She also writes nonfiction, ranging from stories of her travels to thoughts on the Bible. Currently, she lives in Salem, Oregon with her husband Chris and our cat, Thomas. Loved the interview and love that Miss Ward is from Reno! I just moved away from Nevada and miss it so much! Great interview! I've seen Emily and her book on a couple of different blogs. I know I've mentioned this before, but the book cover is beautiful. This book sounds amazing! I've got to read it!!!! Book sounds great! I love the cover. :D Thank you! Awesome interview Emily and Anjana! Looks like a great read! Thanks Anjana - so glad I stopped by! Sounds very interesting, Emily! I like to hole up inside during the winter months too and a perfect oportunity for writing! I loved her answers! I really wanna read that book! I love the names Grace&Dar. And she hasn't read Twilight? I thought everyone has read it :) lol.